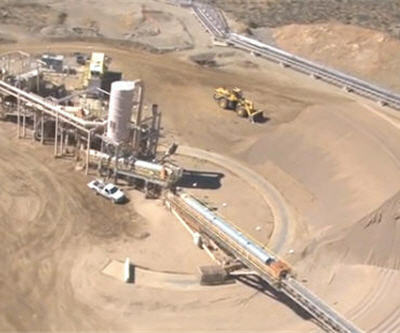 US-based Molycorp Inc. (NYSE: MCP) announced its first quarter results Thursday after the market closed. The rare earth miner reported revenues of $146.4 million, which was 9% more than in the previous quarter. As well, it reported a net loss of $50.1 million. Excluding inventory write-downs and other items, the loss was $20.3 million, or 15 cents per share. These results were better than expected, according to Thomson Reuters I/B/E/S, as analysts were expecting a loss of 27 cents per share. During the quarter, the company saw a negative cash flow of $36.6 million owing to its operating activities. By the quarter's end, the cash balance was $404.8 million, although this is an increase from the fourth quarter in 2012 when it was $227.8 million. Capital expenditures were $181.1 million and it projects a further $250 million in expenditures for the rest of the year. Molycorp presented a breakdown of sales and revenues for the quarter in each of its four major business segments. For resources, which includes rare earth oxides, it sold 763 tonnes at $23/kg. In chemicals and oxides, its volume was 1,866 tonnes at $34/kg. With magnetic materials and alloys, it moved 1,263 tonnes at $43/kg. In rare metals, it put out 81 tonnes at $339/kg. The company expects the second half of this year to be better when sales pick up and its Mountain Pass facility will be in full commercial production. It also said it is beginning to see demand levels return to normal. After hours on May 9, Molycorp shares were trading at $5.97 at 6:20 EDT, up 6.8% from close and within a 52 week range of $4.70 – $26.10.